It’s always interesting when Chris and I go to see the latest Disney animated movie at the theaters. We’re usually the only married couple there without children, and I think it’s safe to say that we tend to enjoy the movies just as much (maybe even more!) as the five-year olds sitting next to us. Big Hero 6 was one of those movies that made us laugh, cry, and feel all the feels. I wasn’t expecting to fall in love with all the characters like I did, and I knew immediately that this movie would be one we’d share with our kids in the years to come. Whenever a new Disney movie is released Chris and I have a tradition where we have a movie night, fix a light meal, pig out on dessert,.and then regret our food choices the following day Big Hero 6 was no exception to our fun tradition, but this time we did something a little different. To celebrate the movie release we channeled our inner child and used my Silhouette Portrait to create some fun crafts for movie night! 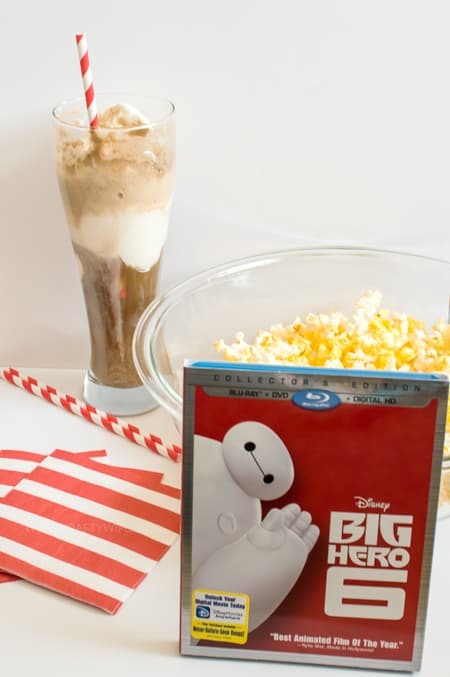 Who doesn’t love popcorn and root beer floats for movie nights? 1. Download the Baymax, Honey Lemon, and Fred legacy3 files onto your computer and open them up in your Silhouette design studio software. 2. 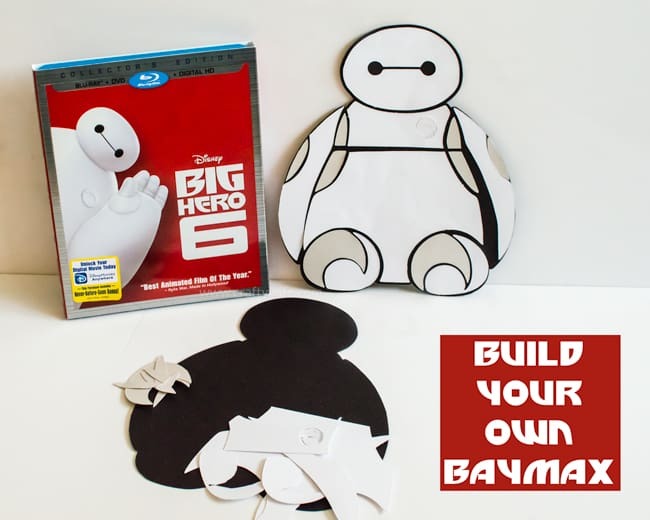 To cut Baymax, separate the three layers and cut them separately. I used black cardstock for the back, white for Baymax’s body, and a silver paper for accents. Then group the three layers together so that each shape is easy to find and easy to put together! 3. To cut Honey Lemon and Fred, place a sketch pen in the blade holder of your silhouette and draw the characters (you’ll still hit cut once you’re ready, but because you’re using a sketch pen the Silhouette will draw instead). Once the characters are drawn, keep the paper in the Silhouette and change out the sketch pen for the blade. Then cut out the character. I loved having two different types of projects to get us ready for the movie! Building Baymax was a fun activity that my husband really enjoyed and I loved sitting down and coloring in Honey Lemon and Fred. We’re such kids at heart. 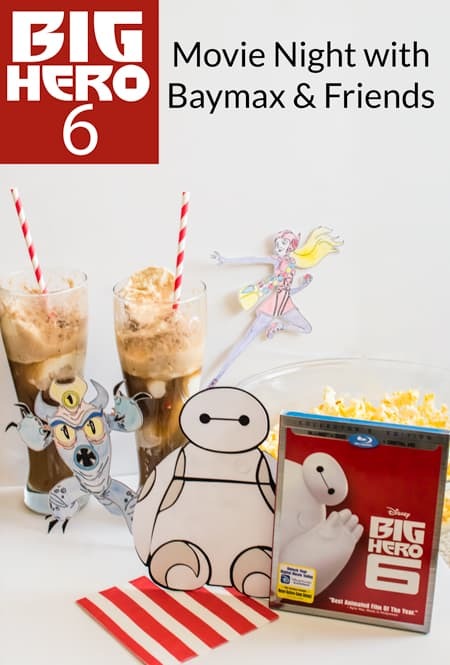 Head over to my favorite store, Target, to pick up your very own copy of Big Hero 6 as well as some yummy snacks to complete your at-home movie night! Have you seen Big Hero 6 yet? Which character is your favorite? I loved Big Hero 6! This is such a fun activity to do with kids! I really have to see this movie now! We’ve been on a roll of watching good family movies lately so we’ll have to add this one to the list! I love your crafts, I really need to get myself a Silhouette! Thank you so much, Cathy! It’s such a great movie with an even better message! My husband and I love it, and will probably watch it again soon! Thanks for the heads up, I’ll go check out your post! Having a viewing party for the movie is definitely the way to go! I hope you are able to watch it soon and I really hope you enjoy it! It’s such a great movie with an even better message. Thank you so much for stopping by!